- Preheat the oven to 350°F/180°C (it really has no purpose doing this now because the cookie dough will need to lay at least 1 hour in the fridge). - Cream the butter and sugar together until pale and moving toward moussiness, then beat in the eggs, vanilla and lemon juice. - In another bowl, combine the flour, baking powder, salt and lemon zest. Add the dry ingredients to the butter and eggs, mix gently but surely (I suggest using a dough hook attachment on your mixer). If you think the finished mixture is too sticky to be rolled out, add more flour, but do so sparingly as too much will make the dough tough. - Sprinkle a suitable surface with flour, place a disc of dough on it, not taking out the other half until you've finished with the first, and sprinkle a little more flour on top of that. - Roll it out to a thickness of about ¼ inch (0.6 cm). 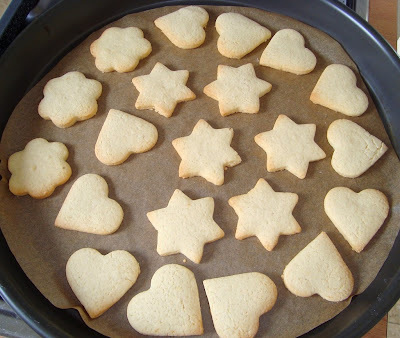 Cut into shapes, dipping the cutter into flour as you go, and place the cookies a little apart on the baking sheet. 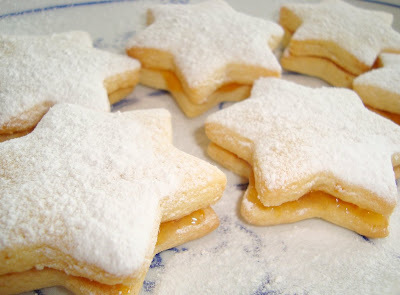 - Bake for 8 – 12 minutes, by which time they will be lightly golden around the edges. Cool on a rack and continue with the rest of the dough. 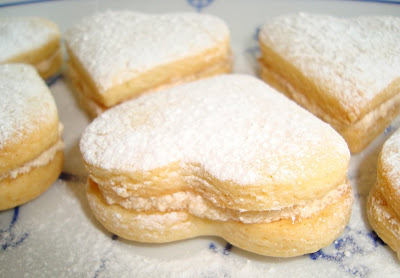 - In the bowl of an electric mixer fitted with the paddle attachment, beat the butter and confectioners' sugar until light and fluffy, about 4 minutes. - Beat in the honey. - Add juice, 1 tablespoon at a time, until filling holds together and is smooth and creamy, about 2 minutes. - Transfer to a small bowl, cover and set aside until ready to use. I assigned each different shaped cookie to a particular flavor. So that I did't get confused! I had a grapefruit that was lying in my kitchen for weeks, so I decided to also make home-made grapefruit cream filling! 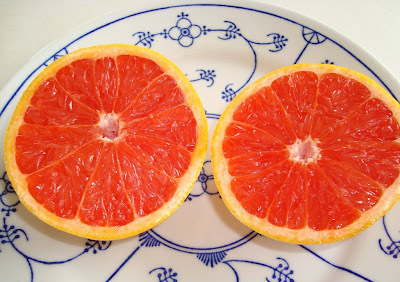 How beautiful is this grapefruit sliced down the middle. Lemon as raspberry go so well together. I tried Martha's recipe and they weren't too great. will have to try this one because I'm a huge fan of Nigella's. 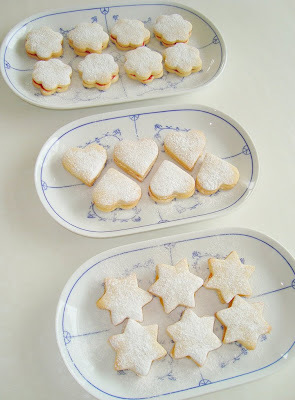 wow - your cookies are so so beautiful! 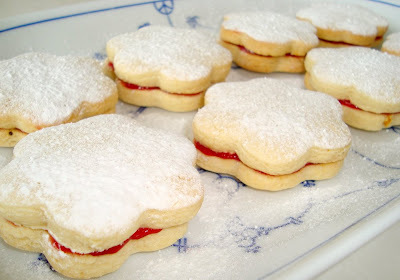 I have been looking for a sandwich cookie recipe and here it is :) I am going to try out this recipe very soon :) Cheers! Looks delicious =] how long do the cookies have to be in the oven for, though?